On behalf of the Board of Trustees and ATA Comp Fund staff, we would like to thank our Fund Members for achieving this milestone through our combined efforts. This is due in large part to the implementation of our risk management model and safety services. 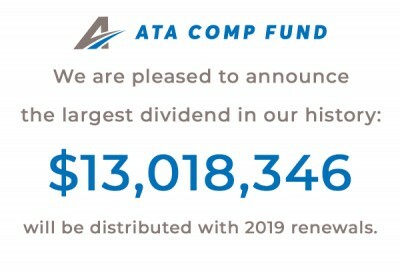 Since 1993, the ATA Comp Fund has returned a historical dividend average of 20.21% to our participating member companies. We look forward to another successful and profitable year in 2019.